The key of using your surveys is displaying them to the right customers. 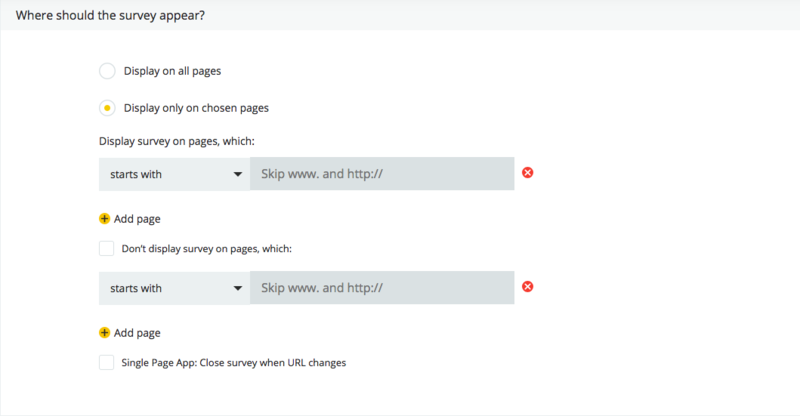 One of the simplest ways of differentiating customers by their behaviour is showing surveys on certain pages. This lets you reach only these users, that are worth it. The red button on the side of a rule lets you delete it. It’s also possible to Close survey when URL changes which is useful for Single Page Apps. To do that, enable the checkbox at the bottom of this section.